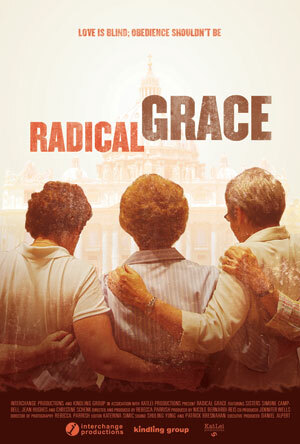 To better capture Sister Simone, Sister Jean, and Sister Chris’s struggle for gender inclusivity and social justice, we are proud to announce that our documentary will now be titled RADICAL GRACE! We feel that RADICAL GRACE encapsulates what these three brave sisters are trying to accomplish: to help usher society to a place where all people, regardless of gender or race, are equal to one another; where the modern struggles that affect humanity are met with an equally modern perspective. And we have you to thank for picking RADICAL GRACE. Hosting the naming contest was an amazing experience, and thank you all for choosing a title that so perfectly reflects the story our documentary is trying to tell. Please note that the names on our social media accounts on Facebook and Twitter will also be changing to Facebook.com/RadicalGraceFilm and Twitter.com/@radgracefilm. Again, thank you for your generous support; we would not be able to make this film without it. We look forward to sharing in the coming journey of completing RADICAL GRACE with you! This entry was posted in Updates on January 22, 2014 by Radical Grace. You are currently browsing the Radical Grace blog archives for January, 2014.